Office space prices ranging from ₹10000 - ₹13000 per month. The Centre is close to the Ramakrishna Beach which offers nice cafes and restaurants at their promenade. 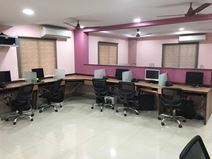 It is perfect for start-ups, freenlancers and independent workers as they offer customizable offices as per your business size. That you can focus on your work they offer you unlimited WiFi, power back-up and air-conditioning. If you would like to have some entertainment then you can visit one of the theatres, cinemas or museums based in this area. Offering fully furnished executive suites and open-plan office space with wonderful views over the city this professional business centre benefits from a major commercial business district location in Visakhapatnam. This coworking space is well-designed, fully managed and totally affordable. Based in the perfect location near Hotel Green Park, this business centre is ideal for start-ups, freelancers or independent entrepreneurs - with a "plug and play" set-up, collaborative working takes no set-up time at all. Ample bicycle storage and proximity to local restaurants, banks and shopping outlets provides opportunity for a fantastic work-life balance. Luxury plug and play office space offering co-working areas, meeting rooms and work stations with high speed internet, air conditioning, housekeeping, parking with a valet service option as well as many additional services such as secretarial, accounting and networking support. Centrally and easily located in Visakhapatnam, within walking distance to Care Hospital, Four Points by Sheriton and Dutt Island.